HUGH HEWITT: Morning glory, America. Bonjour. Hi, Canadians. I am Hugh Hewitt inside the relieffactor.com Studios. That music means it's the last radio hour of the week, and that means time for the Hillsdale Dialogue. All things Hillsdale, our great little lantern of the North, are collected at hillsdale.edu, including all of their online courses, which are so central to your understanding of the West and Western civilization, the rule of law. Great stories and courses on the Constitution, on the history of America, on the ideals that drive us forward. All for free, as is the speech digest Imprimis, which you ought to be getting every single month in your mailbox for free. You sign up for it at hillsdale.edu. All these conversations, dating back to 2013, with my guest Dr. Larry Arnn, President of Hillsdale College, or one of his colleagues, are all collected at hughforhillsdale.com. Dr. Arnn and I are making our way through the Constitution now, and soon to The Federalist Papers, but we are blessed, Dr. Arnn. Good morning. Good to talk to you, my friend. LARRY ARNN: How are you? Good morning to you. HUGH HEWITT: I am good. We are blessed that the Supreme Court took up Article III the same time that we are doing Article III. But before we get there, I want to ask you about the week that was with President Trump and his decision to extricate himself from the immigration mess, which I think he has done effectively. What do you think? LARRY ARNN: Yeah, I agree. Immigration policy is about the ugliest mess in history. And as I understand it, this thing about separating children from their parents after they cross is an old problem, and it comes from two things. One is it's illegal to come into the United States illegally, to use a great tautology. And if you bring your children with you, you are involving them in an illegal act. And then a 1997 court decision said you have to let the children go after 20 days. And so what Obama did was just let everybody go, and what Trump was doing was just giving the children to the care of the Department of Health and Human Services, which is not the worst thing in the world, but doesn't sound to me like the best thing in the world either. So what he's going to do now is try to house them all. Meanwhile, Congress is passing a bill. I read this morning they're not going to pass it this week. And the bill looks like it's pretty good to me. It's not as good as the Tom Cotton Bill that would implement a point system for immigration to the United States, which is really what the solution is. We should just import people who can share the practices and beliefs of a free republic and get a job and work. And that's what Canada-- that's what most people, most countries, do. So anyway, we should do that. But what this bill does is it puts $25 billion to build a wall, or part of a wall, and it provides for better control of the border. And it provides something for the children who've come. There's what, 1, almost 2 million people, I think, who've come in under the Deferred Action for something, children to come across the border illegally and were allowed to stay. And there's something close to 2 million of them and they get some path to citizenship. So that bill would be a good help, but in the meantime, Trump has found a way to keep the families together using the Department of Defense. See, one last thing. If you think about it hard for a minute, you'll soon see that a country has to have a right to control who comes into it. Because you can just imagine a million sort of situations that would go up if that principle were not true. It stems from consent of the governed. We form a country by consent then the people who are governed in the country have a right to control the country. And it's hard to think about the United States being overwhelmed, simply overwhelmed, by mass immigration. It's a very big country. But imagine a small country. Imagine a country that's specific, that was once governed by a friend of mine, president Vaclav Klaus, and his wife was ambassador to Slovakia. And the Slovakians and the Czechs have separated peacefully, and they're still friends. What if they weren't? What if they were bitter enemies? And what if all the Slovaks decided to move into the Czech Republic, or vise versa. You'd have a different country. And so the point is country has a right to borders and a right to control who joins it. HUGH HEWITT: And it seems to me-- I have a piece in The Washington Post this morning. The President has a winning issue. A vast majority of Americans will not accept the idea of 50,000 people a month coming into the country over the southern border. That's what's happening right now, 50,000 people in May. 50,000-- and those are the ones that we detained. We don't know how many were effective in avoiding detection and detainment. And so it is, in essence, a quasi-open border, and he wants to build a fence. He calls it a wall, I've been calling it a fence since 2004. That's wildly popular. The Republicans have always been afraid of it. They don't want to be called racist, but, in fact, it has nothing to do with race. It has everything to do with sovereignty. And so in my Washington Post column, I say today, "It is the visible expression of an invisible resolve to maintain your sovereignty." That's a winning issue. It's very popular. But it's not as popular as separating children from their families is unpopular. And so he allowed, for a brief period of time, his advisers to elevate the latter on top of his demand for the former, and he fixed that, as was smart, I think. LARRY ARNN: See, the government is very inefficient. And so a lot of things, foolish things and awkward things, that Presidents do-- any President, Obama, too-- are often things that happen to them. So first of all, just think how this goes. It's very hard to get a bill through Congress these days, especially a bill of substance, and that's because the Congress is not really a deliberative body anymore. It's now mostly delegates legislating, the job of legislating to bureaucratic agencies, which passed 10 times as many laws as Congress. And so Congress is doing some other job now. It's all divided up and it's hard to get a bill through. That's one problem. And then district courts, not the Supreme Court of the United States, have decided that it's a violation of the rights of an illegally entering child to hold a child for more than 20 days. They picked 20 days. Why not 30 days? Why not 60 days? So the court proceedings that go on go on for 60 days. Others go on longer than that. So you've got a court. It's a California-- with the Flores case, I think was a Ninth Circuit case, and that's a very liberal court. And so they've decided for the whole country, and that means that although we have laws that govern when you can come in here, that court decision, coupled by the inaction of Congress to adjust to the court decision, effectively establishes open borders for those people who bring children in. And that's just not a good-- I mean, if you're trying to run a business or a college that way, it's just chaos. And so a lot of things are just chaos, and the President is busy-- any president-- is busy all the time, trying to fix things that result from that chaos. HUGH HEWITT: Yeah, but the ability to fix it means that people give you good advice. That is, to me, the key here, Dr. Arnn. From the beginning of the Republic, even if you're a great man, like Washington, you need Jefferson as your Secretary of State. You need Hamilton as your Secretary of the Treasury. And they've got to give you good advice or you will run into trees. LARRY ARNN: Yeah, that's true, and I agree with that point wholeheartedly. I'll also comment, you do need to be a great man, because, of course, poor George Washington had the brilliant Hamilton and the brilliant Jefferson, and they didn't like each other and they disagreed a lot. HUGH HEWITT: And he had the brilliant Adams, who was shut out of the meetings. So in fact, we're down to the point here, which is that when you have many people around you telling you A, B, C-- and this is complicated. You just referenced the Flores settlement in 1997. There are three intervening statutes. There is the Limit of the Executive Order. There is Ted Cruz working with Dianne Feinstein on a skinny bill. There is Tom Cotton's very cerebral, very good approach on immigration. There is a House Immigration Bill, which is a smoking hot mess of conflicting approaches. And the President has to do something. And I just believe he ought to have the scorecard of those who give him good advice and those who give him bad advice, and to elevate those who give him the former and to demote those, if not fire those, who give him the latter. You're a president. What do you think of that assessment? LARRY ARNN: Well, two things. One is Donald Trump does not seem unwilling to let people go. HUGH HEWITT: No, he doesn't. LARRY ARNN: And the other is it's very hard. The way the college runs-- the college is-- Hillsdale College is stable, right? I mean, we're a bunch people who've been working together for a long time. And the college is growing, and so we're adding more. And let's say, when I first became the president of the college, there were some changes, and not as rapid anymore. But that's right. And everything is a dynamic. First of all, so I've been president of Hillsdale College for 18 years. And that means that I've got time to look forward to, too, likely, God preserving me. And so we can plan. Presidents last four years. And so there's a lot of change. And so building a team is not easy, but you're exactly right. You should do that. HUGH HEWITT: And we'll be right back with Dr. Larry Arnn. We must remember Charles Krauthammer and we must get to the Supreme Court's decision in Gill, which is about Article III, cases and controversies and what they do and don't do. Don't go anywhere. It's the Hillsdale Dialogue on the Hugh Hewitt show. Welcome back, America. It's Hugh Hewitt from the relieffactor.com Studio. Dr. Larry Arnn, President of Hillsdale College, is my guest. All things Hillsdale are contained at hillsdale.edu, all the wonderful online courses, all the downloadable audio that you can binge listen to. All of our dialogues dating back to Homer in 2013 are contained at hughforhillsdale.com for your binge listening ease of access. Dr. Arnn, we lost a great man yesterday. Charles Krauthammer died. I do not know your relationship with him. I don't believe we've ever talked about him. We have linked to a number of long conversations I had with him on the radio, and he is a wonderful, wonderful guest. Your thoughts on him and your relationship with him and what his role was? Why are so many people mourning? LARRY ARNN: Well, I knew him for a long time. Well, mostly, I met him because he came and spoke at Hillsdale College events five or six times. But I would see him in things in Washington. I twice encountered him in an airport. And we would talk for some hours, putting all that together. Why is he important? Well, he's a very thoughtful man. He was also a big souled man in the following way. He had an accident, and he lost his ability to walk, or fully to move, even including parts of his upper body. And he carried on despite that, and almost unaffected by that, in his manner and what it was like to talk to him. For example, encountering him in an airport-- and you know how awkward that is when you know somebody professionally and you don't, you know. And I tapped him on the shoulder, and he looked up at me, and oh Larry, he said. He could hold out one of his hands enough for you to shake it. And then what proceeded was a five-minute conversation that was fun and cheerful and informative. So he was a very natural human being who had suffered that terrible thing, but one is reluctant to use the word suffered about it because he was a psychiatrist, which is a medical doctor with expertise in mental illness, and that means he knew a lot of science. And so when he would talk about his condition, he would analyze it for you. Again, he was bigger than his condition. He had a big soul, even if he had a broken body. There's a book of essays-- I'm looking for the title while we talk. HUGH HEWITT: Things That Matter. Things That Matter. LARRY ARNN: That's it. If people go and read the first essay in that, they will see the power of the man. It has much to do with Winston Churchill, which is why I read it. And I wrote him a letter after it, the longest letter I ever wrote him. And I just told him how insightful that was and how great it was that he thought about such things. So that was his genius, I think. HUGH HEWITT: I remember that now. I had forgotten that. I have about four hours of audio with Dr. Krauthammer posted over at hughhewitt.com from when he wrote his letter, announcing that he would be leaving us. And we posted all the audio, and I'd remembered that. That was the only original piece in Things That Matter. Everything else was an essay he had previously published. First hardcover collection of essays in the modern era to sell a million copies. Montesquieu has sold a million. Bacon has sold a million. But they've sold it over 500 years so it doesn't really count. Charles Krauthammer comes out with Things That Matter, and he sells a million copies. It's, to me, because he's on Fox News. And not just because he's on FOX News-- because a lot of people on FOX News don't sell a million copies-- but because he was elegant in argument, which tells me there is a desire for that, Dr. Arnn. LARRY ARNN: Yeah, he was a very intelligent man and so what he had to say was interesting. And there was a consistency. He rethought a lot of things in his life, and he comes to cite, to me and you, probably, after he had become a rebel against the tendencies of the nation. And earlier in his life, he told me once, he had been very comfortable with those. And you can just see that a lot of the things we do in this country will, in the end, bring it apart, if we don't fix them. And they're old things and powerful things, and he stood up against that. HUGH HEWITT: I will be right back with Dr. Arnn. We turn to Article III, which the Supreme Court also did this week. Stand by, America. It's the Hugh Hewitt Show. Welcome back, America, from the relieffactor.com Studio. I am Hugh Hewitt, talking, as I do, in the last radio hour of every week with someone from Hillsdale College, hillsdale.edu. It is time for your rising seniors to go get their college applications in order. Send them to hillsdale.edu. Download it. Get them there. Get them the credential that will set them apart from everyone else in the United States, the certainty of an education. Hillsdale.edu can also educate you with their online courses, and hughforhillsdale.com will provide you, I mean, hundreds and hundreds of hours of listening excellence, because Dr. Arnn's been with me a lot. Dr. Larry Arnn is the President of Hillsdale College. Larry, before we go forward to Article III, what's the application process like now? Aren't you going off the charts with the number of people we're trying to jam through the door at Hillsdale? LARRY ARNN: We are, yeah. It's hard to get into Hillsdale College these days. So my advice to you young people is you have to talk your way in. You have to tell us that you really want to do what we do. And what we do is easy to define, just hard to do. Half the curriculum is the same for everybody. It's a core curriculum drawn from the traditions and from nature itself about what you need to know to be an educated person. And there are two qualities that you young people need, and one is willingness, and that's under your control. How hard are you going to work? What do you want to do with yourself? How ambitious are you? How much will you sacrifice to build yourself a great character in life? And the other is ability, and ability grows, by the way, if you live your life properly. So we look for young people who will succeed at this kind of work, because we want to be in the success business. We want to have a great college. And so we have a lot of applications. It's a weird thing this year. We have, at Hillsdale College, almost exactly the same number of boys and girls. And that's very rare these days. A lot of places, it's getting up towards 70% girls. And this year-- next year's-- freshman class is going to have more boys. HUGH HEWITT: That is very unusual. LARRY ARNN: Very, yeah. And I'll just add something. For the first time-- I announced it at commencement when Mike Pence was there-- for the first time, that I know of, our top 10 students were all girls. Now, the academic profile at Hillsdale College, the entering profile, their grade point average and test scores, are just about exactly equal. We don't have to cherry pick to get enough boys. But the girls do rather better, which means, in my conclusion, boys are just as smart as girls, they're just more often stupid. HUGH HEWITT: May I amend your statement? They are more often found to be doing stupid things. Is that also your experience, as a president of the college, that in matters of discipline, you are more often than not confronted with a male of the species, as opposed to a female of the species? LARRY ARNN: Yeah. There are shining exceptions, but that's the rule. HUGH HEWITT: All right. Let me go to Article III. One of the things everyone, those young men and women, will learn in Constitution is the Constitution of the United States. And Dr. Arnn and I have been moving, as the news and events allows us, through the Constitution. We began Article III last week. 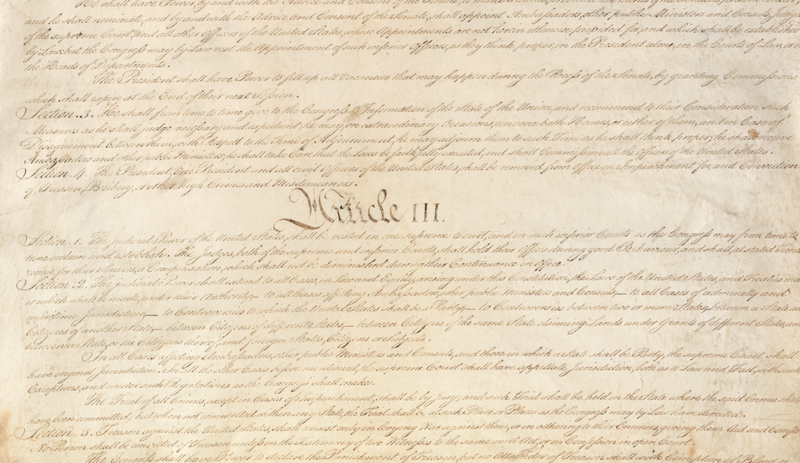 And Article III I read for you last week. Doesn't take very long. It's three sections. It is 1, 2, 3, 4, 5, 6 paragraphs total. In section 2, it says the judicial shall extend to all cases, blah, blah, blah. In section 2, paragraph 2, it says, in all cases affecting blah, blah, bah. Section 2, article 3, the trial of all crime, blah, blah, blah. And the only thing you find are cases and controversies. The Supreme Court is limited to hearing, in the courts of the United States, cases and controversies. So this week, plaintiffs in the state of Wisconsin brought to the Supreme Court for decision, which was handed down this week, their alleged injury, that the state of Wisconsin had denied them their full participation in the politics of America by gerrymandering their districts, meaning writing the lines in the way that the legislature wanted to write the lines for the district. We have only one rule about writing lines. Every 10 years after the census, every American who votes in any district, in any level of government, must, at the beginning of those 10 years, vote in districts that have the same number of people, except for the Senate of the United States, to which we'll come back. In considering the claims of these plaintiffs, that Wisconsin had done them wrong in the drawing of their district lines, the Supreme Court elegantly and concisely said, in the pen of Chief Justice Roberts, "A plaintiff seeking relief in federal court must first demonstrate that he has standing to do so, including that he has a personal stake in the outcome"-- Baker v Carr-- "distinct from generally available grievances about government"-- Lance v Kaufman. "That threshold," writes the Chief Justice, "requirement," quote, "ensures that we act as judges and do not engage in policy making properly left to elected representatives," citing Hollingsworth. "Certain of the plaintiffs before us," writes the Chief Justice this week, "alleged that they had such a personal stake in this case, but never followed up with the requisite proof. The district court and this court, therefore, lack the power to resolve their claims. We vacate the judgment and remand the case for further proceedings in the courts of which those plaintiffs may attempt to demonstrate standing in accordance with the analysis in this opinion." End of paragraph. That's the holding. Bravo, Chief Justice Roberts. What say you, President Arnn? LARRY ARNN: Well, so I have three things to say. First is this Saturday, tomorrow, Justice Thomas turns 70 years old. Everybody should say, hooray. HUGH HEWITT: Hooray. Happy birthday, Justice Thomas, who may, in fact, be listening. LARRY ARNN: Also, my wife turns 29 tomorrow. HUGH HEWITT: Perfect. Oh, they share the same birthday. LARRY ARNN: They do. I learned that this very morning with him. HUGH HEWITT: He ages and she does not. That's great. LARRY ARNN: Yeah, it's great. So the second thing is Ryan Walsh, one of the smartest kids I ever saw, is now a Chicago Law graduate, clerk for Scalia. Was going to sit in the second chair on that case before the Supreme Court. And the third thing is I'm so glad that case is not going there, except to be dismissed. And the reason for that is, just think. Once you understand the Constitution a little bit, you can see that there are various things that are very sensitive in it, and most sensitive of all is the electoral process. Because in a purely representative government-- think what that means. That means the government represents us, but we can't do anything except through the government. The only means we have to control it is through elections. And so elections have been decided through politics, and how they're shaped and their structure. And they vary. States vary widely in their political complexion. And part of the founder's purpose is achieved by that being true. And by, for example, being elected president, you have to appeal widely around the country. And so there's a lot of institutions that are hallowed that have grown up from the founding, and the state control of district boundaries is one of them. And I personally think they should make the boundaries more fair, and I even think that ways are known to do that that have this advantage. It's hard to predict in advance exactly which party will be advantaged, but there's ways to draw a line so that you have a rule that you have to start up in one corner of the state and go contiguous all the way through the state and get the right number of people. That apparently would work. And there's ways to let computers do it, where you get the most contiguous districts, where the edges are closest to the center. And apparently, both of those would yield-- because you can model them now. And that's a change in all of this gerrymandering stuff, because it's scientific now. That's why the famous thing that you and I will know about, Hugh, that Willie Brown drew a-- well, he was running for California. He once drew a district that had about a 50 mile section that was as wide as a highway. HUGH HEWITT: It was so beautiful. A thing of beauty, actually. Gerrymandering gets its name from Albert Eldridge Gerry, who was a framer. And they drew him a district up in Massachusetts, which looked like a salamander. So they called it a gerrymander, and that's what it comes from. I always like to remind people, though, Dr. Arnn, when our brilliant framer sat down to organize a series of compromises that became the Constitution, the first thing they had to do was say, we will not have one person, one vote. First of all, slaves could not vote. Secondly, women could not vote. But they had large states and small states, and the first thing they did is every state shall have two senators. So at the heart of the Constitution is numerical inequality. LARRY ARNN: Yeah. And see, just remember, voting-- so the Federalist had a kind of general way to put about who gets represented. And it needed to be general for the following reason. The aim of the nation is not voting, it's liberty. And voting and consent of the governed is vital to that aim of liberty. And so Madison says, in The Federalist Papers, that to be representative, the government must represent the great body of the people. And then you can do things like protect the authority of states, which is a protection of decentralization. And that means everything doesn't be gathered up in Washington D.C., which is not what they wanted, and not what most people want today, by the way, although it is considerably happened. So the point is there's a bunch of goods that are served to the constitutional structure, including the way authority flows, because half of the legislature is under the control of states. Indeed, it was a better day, in my opinion, before they amended the Constitution. The state legislatures appointed senators. And if you want to think of some way so that you could protect the authority of states so the federal government doesn't just gobble up everything on earth, just repeal the 18th amendment. 17-- 18th amendment. 17th amendment. 18th amendment's already been repealed. HUGH HEWITT: I've got to say, it goes back to-- when we talk about district lines and people who get to bring their cases and controversies before the court, we can't allow everyone to turn the courts into their grievance proceedings. And we can't allow an individual, just because they're a taxpayer, to bring an assault on the lines that have been drawn. We have to elect people. And if you're upset with your lines, elect people who are upset with the lines. Isn't that the basic argument? LARRY ARNN: That's right. So there's a paragraph in that Wisconsin case that I don't like. Because the court speculates toward the end of the opinion-- and I do like the opinion, and praise to Justice Roberts. And you know, all nine of them voted for parts of that opinion. LARRY ARNN: But there's a prospective, or future looking, paragraph, in which he says, well, if a case arises that does this thing, right? But the truth is, that's not the court's business. The court gets cases before it. And one safeguard for the court not becoming imperial, which it is doing because it's the partner of the bureaucracy and really running the country, is that they should stick to that. In other words, whatever may arise in the future, these facts in front of us today, and the laws that concern them, compared to the Constitution of the United States mean this. And they should just say that and stop. HUGH HEWITT: Amen. Say that and stop. When we come back, we'll talk about what happens if they don't. Don't go anywhere. I'll be right back with Dr. Larry Arnn, as the Hillsdale Dialogue continues. Go over and sign up for Imprimis during the break as well, and be right back here on the Hugh Hewitt Show. Welcome back, America. I am Hugh Hewitt in the relieffactor.com Studio inside the Beltway. My guest is Dr. Larry Arnn, President of Hillsdale College. It is the birthday of the wonderful Mrs. Arnn, First Lady of Hillsdale, and of Justice Clarence Thomas, friend of Dr. Arnn, acquaintance of mine, and author of the concurrence, in part. In the opinion of Chief Justice Roberts, we were talking about, in the Gill case, and in the judgment. And since it is his birthday, I think I will read, if you don't mind, Dr. Arnn, the entirety of Justice Thomas's concurrence, with whom Justice Gorsuch joins, concurring in part and concurring in the judgment. "I joined parts 1 and 2 of the court's opinion," writes Justice Thomas, "because I agree that the plaintiffs have failed to prove Article III standing. I do not join part 3, which gives the plaintiffs another chance to prove their standing on remand. When a plaintiff lacks standing, our ordinary practice is to remand the case with instructions to dismiss for lack of jurisdiction." And here he cites a few cases. "The court departs from our usual practice because this is supposedly, quote, 'not the usual case,' Ante at 21. But there's nothing unusual about it," writes Clarence Thomas. "As the court explains, the plaintiff's lack of standing follows from a long established principle of law. After a year and a half of litigation in the district court, including a four day trial, the plaintiffs had a more than ample opportunity to prove their standing under these principles. They failed to do so. Accordingly, I would have remanded this case with instructions to dismiss. End of concurrence." Justice Thomas has an economy with words that really, really, really could be useful everywhere. But the Chief Justice wanted to bring the court with him, so he left the door just slightly ajar. LARRY ARNN: Yeah. I'm so glad you read that. I had not read that. And it's an experience that I have, attending to Justice Thomas now for 30 years, I very much bridled at the end of Roberts' opinion. I thought it was wrong, headed in the wrong posture of the court. And I didn't know that Justice Thomas had written that thing. It's not brilliant because he agrees with me, it's brilliant because, gosh, don't you learn something from that? LARRY ARNN: He said that point a lot better than I did. HUGH HEWITT: Yes. He's a Justice of the Supreme Court. You're running a college. You have to do things more than just consider 65 cases. 65 cases a year, it's like 15 each, or 10 each, if you write your dissents. What do they do all the time, you wonder? LARRY ARNN: Yeah. I know about his work day. HUGH HEWITT: I know. They listen, too. I know they listen. LARRY ARNN: They work hard. And think about Gorsuch, too, who is, by the way, the greatest modern-- I told Justice Gorsuch this. You've written the greatest modern judicial opinion. And he replied, hogwash. And then I proved my case, because I had brought the page with me in Reitz vs US, a district court decision that he wrote. He diagrams a sentence, a statue, to discover-- like you used to do on the blackboard in grammar school, if you're well educated. And it's just brilliant. And it just whipped around Hillsdale College like a whirlwind. Look at that. The guy's diagrammed the sentence. And I held that up and I said, there's my case. HUGH HEWITT: There's your case. Proof. LARRY ARNN: And I said, everyone at Hillsdale College is reading this. And he said, oh gosh, is it accurate? HUGH HEWITT: All right. The last question, speculation on retirements. There is some speculation that Justice Thomas is more likely to retire than Justice Kennedy. What say you? LARRY ARNN: I don't think so. I don't have inside knowledge about that, let's say, although I do happen to know him and his wife. I call her a friend. I don't call him a friend because he's a high constitutional officer. But he's very dutiful. He thinks that he was put there for some work. And for one thing, I would doubt very much that he would retire at a time when his vote is critical. Because he loves the Constitution and he thinks that God and George W. Bush and John Danforth-- his political mentors, George H.W. Bush, the one who picked him-- he thinks that he was put there to do a duty and fulfill his oath. And it's very much needed. By the way, I think that he had wanted to retire since he got on the court. LARRY ARNN: He loves something about the work. He loves figuring it out and working with his clerks. And his clerks are a precious thing to him, and he picks them very carefully. And I happen to know a few of them. One of them is a student of mine. And they love him. So he loves the actual doing of the work. He doesn't much like the trappings of it, doesn't participate in those to the extent that many of them do. And so yeah, in one way, he'd love to retire and go drive his bus around the country and stay in campgrounds. On the other hand, he's got a job to do. And Lord, can he not do it. I actually regard him as the best of them. HUGH HEWITT: Always great to talk with Dr. Arnn on these and other subjects. We'll continue next week on the Hillsdale Dialogue.